While 30,000+ people braved the London Marathon a couple weeks ago, I engaged in the ultimate antithesis: a lazy Sunday Brunch at Hawksmoor. Prior to this, I’ve only had the joy of dinner at this Spitalfields institution. They do some of the most incredible steaks in town here… pretty much any cut under the sun… Bone-in Prime, Porterhouse, Chateaubriand, Sirloin…. You name it. They’ve got it. In absolutely any size you want it. I’ll leave the steaks for another time as it deserves a separate post of its own really. For now, its back to Brunch. It was barely past noon, so although all the above-mentioned steaks were on the brunch menu, it was much too early for a cow to be sacrificed. 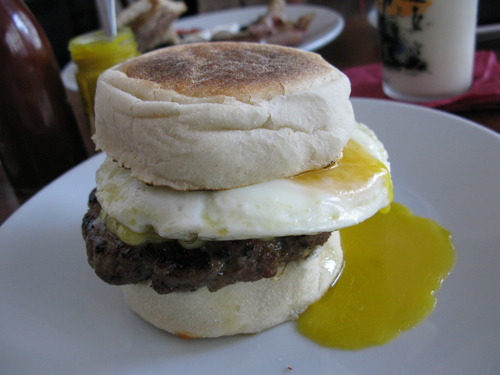 I went instead for something from the Breakfast menu: the Sausage and Egg HkMuffin… deemed by Hawksmoor themselves to be the ultimate guilty pleasure. For a place that does such great meat, the result was a predictable one. Think a McD’s Sausage McMuffin… only this beast is 3 times the size and on Steroids. No reprocessed meat and overcooked yolks here. Just absolute bliss, especially when dunked into their very own home-made ketchup which I’m convinced could topple the Heinz empire if ever mass-produced. 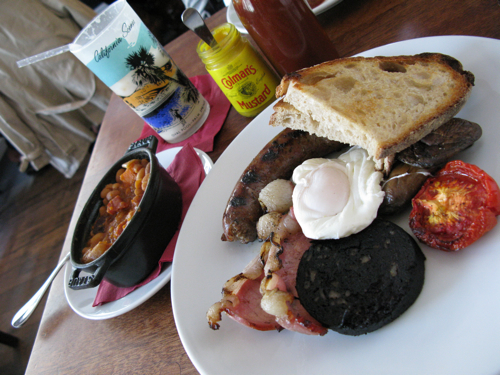 Jo opted for their full English – a generous spread of Home-made Sausages, Tamworth Bacon and Eggs as you like’ em accompanied by Toasted Sour Dough, Black Pudding, Grilled Tomatoes and a lovely pot of Baked beans spiked with smoky Chorizo and Swedes. Some seriously good comfort food and top-notch produce. 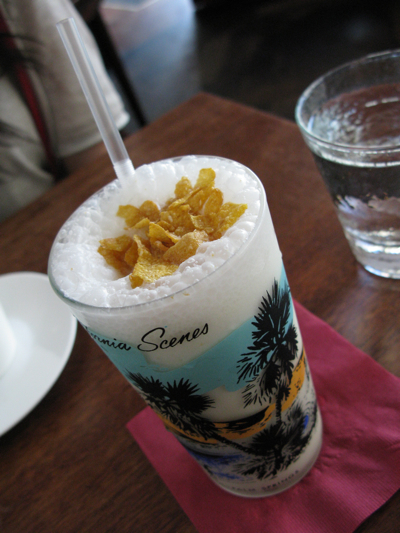 The real revelation though was the Cornflake milkshake. I’ve been dying to try it ever since I read the raves about it on Tom’s blog. All i can say is, I felt 6 years old all over again from the first sip. It’s one of those thoroughly original and ingenious culinary creations that takes you on a roller-coaster of sensations: confusion initially… then familiarity… followed by nostalgia… and eventually, pure elation as the brain comes to realise what its like to rediscover and taste something for the first time. You won’t find a happier brunch elsewhere. I don’t like brunch that much, but I want those stuff you ate! WildBoar: Haha, its a real beast of a McMuffin =). Was a very good brunch on the whole. The milkshake was really quite something – been thinking of getting my much neglected blender out and experimenting with cornflakes, ice-cream and milk! Thanks for the post – really glad you enjoyed the brunch. Hopefully see you again for the steak experience soon! Will: I will most certainly be back. If not for the bone-in sirloin, definitely for the ketchup =P.